A two-man team of an American and Russian pilot is currently mounting an attempt to set new world records for flight duration and distance for a gas balloon flight across the Pacific Ocean. The crew of ‘Two Eagles’ set off from Japan on Jan. 25, and hope the journey will last six days. A combined U.S.-Russian team is attempting to break two world records by flying a gas balloon across the Pacific Ocean from Japan to North America. The U.S.-Russian gas balloon “Two Eagles” was successfully launched from Saga, Japan, on the morning of Jan. 25, 2015. 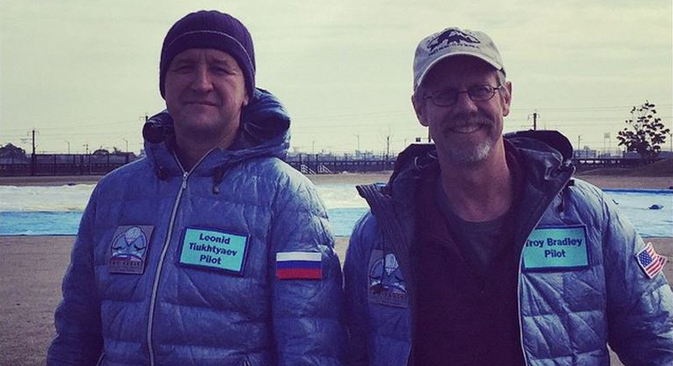 The pilots - 58-year-old Leonid Tyukhtyayev (Russia) and 50-year-old Troy Bradley (U.S.) – intend to break the two world records on gas balloons for flight duration and distance. Pilots will have to cover the distance to the west coast of the U.S., about 5,590 miles. The current distance record for a gas balloon is slightly less than 5,208 miles. The team’s exact destination in North America is not known because the location will depend on the winds the balloon encounters along the way. The Two Eagles live tracking page shows that the balloon passed to the north of Hawaii on Jan. 26 and is heading toward the coast of Oregon, in the northwest of the U.S.
Tyukhtyayev and Bradley hope that the flight will last six days, which will surpass the previous record of 137 hours. The balloon’s capsule is equipped with the latest navigation equipment, and the pilots are maintaining communication with their command center in the city of Albuquerque, New Mexico. The balloon will fly at an altitude of at least 15,000 feet, with a temperature of around 50°F (10°C) inside the capsule, requiring the pilots to use oxygen masks. The flight has been monitored by specialists at Arizona State University who are interested in the impact of such severe conditions on the human body. Tyukhtyayev and Bradley have sleeping bags and a small onboard heater. The balloon is also equipped with a simple toilet. Leonid Tyukhtyaev is President of the Federation of Aeronautics in Russia and holder of eight world records in the field of aeronautics. Troy Bradley has spent 6,000 hours flying balloons of different types and has broken 60 world records.